By panpanya. Released in Japan as “Kani ni Sasowarete” by Hakusensha, serialized in the magazine Rakuen Le Paradis. Released in North America by Denpa Books. Translated by Ko Ransom. Iev always been a fan of those sketchy, semi-slice of life (except they’re too weird) manga that you see towards the back of a lot of seinen and josei manga magazines. It used to be that the chances of such works getting licensed over here was nil, but Denpa has quite a few eclectic titles coming out now, and An Invitation from a Crab is one of the first. It’s more of a collection of interconnected short stories, along with the occasional essay discussing the importance of paying attention to things. Our unnamed heroine is theoretically a high school student, and occasionally we do see her in class. But the world she’s in is not quite the same as ours, featuring normal humans but also animal-headed people, as well as the bizarre lemon with an eye that seems to be a ‘boss’ sort of type. 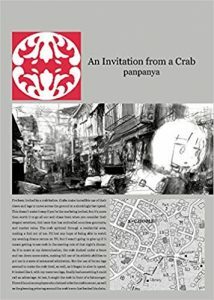 Essentially, An Invitation from a Crab is a “what kind of stories will the author spin next?’ sort of book. And they’re good stories. The stories here range from a few pages long to larger chunky narratives. The title comes from the first story, where our heroine follows a crab that is lying in the road and seems to know where it’s going. That said, the “punchline”, as it were, amounts to not much, and that’s also the case with most of the rest of these stories. You’re reading this for mood, not for jokes or characterization, and so frequently the stories feel like “shaggy dog” stories, where the ending does not justify the effort expended. Which is absolutely fine given much of this is about enjoying the journey. We see our heroine wearing a Chinese communist outfit in a factory breaking coconuts so they can be used to create electricity. That is a sentence I can’t believe I just typed, and it’s probably the weirdest of the stories in here, but there’s other dreamlike sequences as well, including one that literally is a dream, where our heroine’s spirit gets off a train but her body doesn’t. There is quite a bit of humor here, despite my saying earlier that there weren’t punchlines per se. Sometimes simply seeing the situation makes me laugh, such as our heroine and her dog/roommate/whatever searching to try to find anyone who knows where pineapples come from, or the heroine gleefully preparing for her Sunday day off by doing piles of things (this reminded me of the Zetsubou-sensei chapter where the class had a “preview” of their field trip). And sometimes the mood can be disturbing – there’s a lot of dark shadows in this world, and while the coconut and lost body stories are not dark in any way, they’re unsettling and have a sense of unreality to them. Even some of the shorter stories in the volume, such as when our heroine is sold a giant salamander and tries to return him to the Amazon (a plot that lifts directly from an old Bugs Bunny cartoon), has an ominous feel to its humorous ending. If you’re interested in a skewed look at life in a world that’s not quite this one, or wonder what it would be like if you did follow that crab into the side alley, you should definitely pick this up.